It is next to IMPOSSIBLE to decide when to shoot a space. I take one picture, and all I see are the five things I want to change about the room. I keep telling myself that I'll have our new Seattle rental (we moved here in July 2017... is it still new?!) photographed when it's "done." But let's be honest, that day will never come. I'm lucky, then, that a breakthrough of sunlight - a welcome arrival during this gray and drizzly winter - made my decision for me. I finished work, snuck in a workout, and came home to the most breathtaking sunshine seeping through our windows. 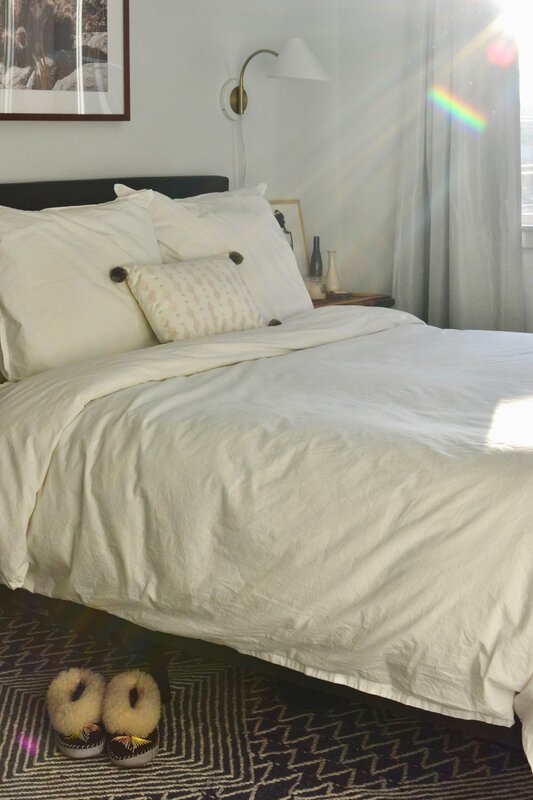 So today, Mutts, you can thank the anomaly that is the winter Seattle sunshine for this peek of our bedroom. No, I did not add those light bubbles to these photos. That just HAPPENED. And I know they're not perfect, professional photos, but holy cow, I had to capture it. When we moved across the country from DC last summer, we literally brought clothing and kitchen supplies with us. The only pieces of furniture were a coffee table in our living room, and the two bedside tables you see above. Oh, and the painting - which is a Framebridge print of a photo I took in my soul city, Palm Springs, CA. The side table on the left is a table that my parents purchased and refinished at the start of their marriage in the 80s; the table on the right belonged to my fiance's grandmother. Both are precious to us and, luckily enough, majorly back in style. We saw exact lookalikes at a trendy vintage store in Seattle a few months ago. So that means that we had to purchase everything else. As someone who moved every 11 months for 5 years, this didn't phase me, but we took our time to make good decisions and find great deals. My proudest purchase is actually our bed. Even though it's a mass-produced item from Wayfair, we spent only $73 on it, and the quality has really surprised us! I hunted down this midcentury Tallboy on Craigslist. It's a tight squeeze in what is already a small room, but it gives me the storage I need. Now that I've accented it with some dried flowers from our local farmers market and a copy of our favorite engagement photo, I seriously love this little corner. And then we splurged on a few things: our Parachute Home bedding; our plug-in West Elm sconces; and our stunning and soft West Elm rug. I waited for sales and have no regrets about these purchases. In fact, we've registered for many more Parachute Home items for our upcoming wedding. They're worth it! I love the way the small but sufficient bedroom has come together. Of course, there are things I'd change if I had a limitless budget, but it's a space that I genuinely love at the end of the day. There is no better feeling than lighting a candle, diffusing some essential oils, and nestling into bed with a good book. I am so excited to share the rest of our home with you all soon; in the meantime, have a great weekend, Mutts!